My training season for 2015 was loosely based on Timothy Noakes 90km Comrades Marathon Training Program from the Lore of Running. Noakes’ program reads a lot like a marathon plan. It’s broken into 13 weeks where the first 6 weeks are a base phase, the next 5 weeks are a build phase, and the final 3 weeks are a taper. Through the base phase I kept things comfortable focusing on getting 8 hours of running in weekly, doing one workout of substance, and becoming accustomed to back to back Saturday / Sunday long runs. During the build phase I tried to do two workouts of substance every 10 days while running longer back to back runs on the weekends. In the final taper phase I cut down hourly volume by 40% three weeks from race day, then ramped up to the hourly volume equivalent to the race duration (an 8 hour race typically meant 8 hours of running this week) two weeks out, then reigning back to short easy runs and a couple intervals the week before the race (these weeks usually totalled 3 hours of running). 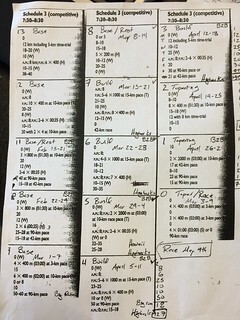 I was only able to do the full 13 week build once at the beginning of the season for the Elk / Beaver 100km, after that I’d start counting backwards from my next race and work through the training schedule from there. I did make a couple modifications since Comrades is a road race and I was planning to run hillier courses. My modifications included: running nothing shorter than 1,000m intervals (I kept the recommended duration though), capping most long runs at 3.5hrs (the program recommended a 50km run), interchanging tempos and hill workouts when I could get to the mountains, and logging trail miles twice a week (usually one of my long runs, and one of my hill workouts). I felt this approach worked out well enough, but balancing quality, volume, recovery, and the “fun factor” through the build phase without an objective eye was harder than I expected. The Man Maker (6-8 reps of 3 minutes on followed by 1.5 minutes active recovery climbing a 7-10% grade) from Rob Krar (check it out on Strava). The 20, 10, 6, 6 Tempo Session: 20 minutes of tempo, 2 minutes of active recovery, 10 minutes of tempo, 2 minutes of active recovery, 6 minutes of tempo, 1.5 minutes of active recovery, 6 minutes of tempo, and profit! The singletrack disappears into a mountain of scree, from here on up small coloured flagging attached to what looked like clothes hangers lead the way. My pace takes a marked dive as I run into the first 45% grade climb of the day. I’m only 22km (13mi) in – the last two hours have been a warm up on excellent singletrack. I pass a fellow runner that says he’s bonking, I hand him a couple emergency gels. Moments later, a baby faced member of the the Team Salomon rips by me charging up the climb with a set of poles. Where did he come from? It’s still cold, there’s frost and a light skiff of snow in the shadows. The sun has only been up for an hour now and I was able to leave my headlamp at the last aid station. I keep moving – often on all four. I crest the hill and I’m intrigued to see a fixed rope to assist on a downclimb. I make my way along the ridge, down the chute with the rope, back up along the ridge and onto another rustic trail obscured by the shadows of the morning. By now a small pack of us have formed, the footing has improved, and we’re charging down the hillside. I’m trying to keep one eye on the trail and the other eye on the sparse flagging tied to the tiny alpine trees. We round a corner just in time to watch three runners tumble down a slippery grass meadow covered in snow / ice / frost. They try to stop, but slide into the rocks below. The group I’m in dials it back, we get down the slope – some of us sliding on our butts – we check on the runners and keep moving. By now we’re 25km into our race with three more substantial climbs remaining and we’re only halfway through The Rut 50km. The Rut packs a punch! The 50km event is just over 51km with 3,500m (11,000ft) of climbing / descending. It boasts some high elevation with a peak that tops out at 3,500m, sections that require all four limbs to ascend, lots and lots of singletrack, and some gnarly / sketchy / rustic sections that require choosing your own adventure – some sections have no trails. It’s an exciting race with a deep field that will certainly test your mountain running chops. It’s also part of the Skyrunning series that are tremendously popular in Europe. When I ran it in 2014 I was floored with how difficult the course was (some reconnaissance on this course is a good idea if you can). 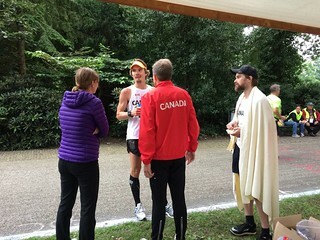 I expected the race to fall inline with what seems “standard” to North American trail races. I expected: a small amount of single track, runnable climbs, lots of double track / fire road, and cruisy descents. This course turned all my expectations upside down. It was a complete brute. Upon finishing it I was mildly disappointed with my performance, because… well… I knew I freaked out / was overly cautious on a couple sections – notably the dinner plate size scree (talus?) field with no trail and the snow / ice covered descent where runners were hurting themselves as they slipped and bounced down the rocks to the bottom. Interesting though, today this race lives on as an epic and I really want to do it again. Here’s my track. It’s fair to note that in addition to an amazing course, this event is also phenomenally well organized – great food, great environment, great accommodations, and great after party. Charlie Spedding’s comments about diet from 1984 are just as valid today. Spedding won the Olympic Bronze medal for the marathon in 1984. His comments above were reflections on the seminars and speaking gigs he gave following his win. It’s interesting that we haven’t progressed in the last 30 years. Whether it’s the high fat low carbs, paleolithic, vegan, vegetarian, or whatever diet. As runners, we’re probably still overly concerned with diet shortcuts and less interested in logging miles and just running like a dog. If you’re looking for a good running book then pick up From Last to First. Spedding’s race recounts are really entertaining. If you have the time also check out 14 Minutes: A Running Legend’s Life and Death and Life by Alberto Salazar too. Both books interweave – both authors ran some of the same races, and were in their peak around the same time. Finding running advice online is tough, fortunately there are many great books on the subject. Here are a collection of quotes and sources that influence my running philosophies. Keep it frequent. Keep it consistent. Run at least 30 minutes. Get used to running frequently, then extend these short runs later in the season. Long runs start at 90 minutes. Be careful exceeding 3 hours. 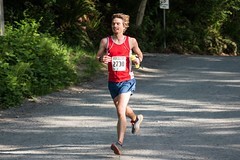 Tempo / lactate threshold workouts are great for long distance runners. Speed / interval sessions are good too. Do some every week. Keep your workouts under control. Rest once a week or whenever you need it. Try not to take two consecutive rest days. When I ran this race in 2013 it was my first run over five hours. After glancing at the course profile online I planned to put most of my effort in the hilly section (the first 33km) then cruise the flat section back to the finish. This was great in theory, but I had never actually seen the terrain. I had no idea what kind of surface I’d be running on, nor had I been acquainted with a coulee, or even been to Lethbridge! The easy flat return section that I had banked on, just did not exist. Instead I encountered: sand, wet slippery grass, sticky mud, bushwhacking, and tiny flying bugs everywhere. What a surprise! My poor hydration, overly enthusiastic pace, and the accumulation of the steep descents finally caught me around the marathon mark. Cramps in my inner calves started alternating between legs. My friends at the final aid stations giggled afterwards about my degrading running form in those final miles - I felt like Frankenstein and apparently I was running like him too. Most of the last 15km was spent managing cramps and on the final steep descent I awkwardly descended backwards for fear of a calf cramp locking my feet pointing downward and sending me tumbling through the cactus, down the steep bank, and into the river. 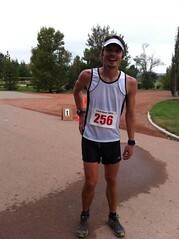 I finished the race in five hours and change (first place), but was running scared those last couple miles. The finish wasn't satisfying, it wasn't a good race, and I realized that I had a lot to learn for these multi hour trail events. In short, the course is more difficult than it looks. The coulees are great fun, but the descents are steep and abrupt. It was quite an insult to nearly tumble back into the river valley after a nice gradual climb, but every great course contains insults - that’s what makes them so great. The running surface of the Lost Soul ranged from narrow well worn trails, to matted paths through fields, to bushwhacking, to very small sections of road. If you’re planning to run it, then practice steep river bank descents, running on grass, and make sure you get your hydration right. Here’s my track. I forgot what a gem Going Long: Training for Triathlon's Ultimate Challenge by Friel, and Byrn is. While this book is targeted towards the athlete training for an Ironman distance triathlon it has a lot of overlap with long distance running material and endurance athletics in general. Here are a couple sections and ideas I liked. The successful traits of an athlete are listed as: confident, focused, self-sufficient, adaptable, quietly cocky, and mentally tough. Confidence is loosely described as balancing respect for yourself and your athletic abilities. Self-sufficiency by taking full responsibility of your actions, and taking calculated risks to try to win rather than trying not to lose. Quiet cockiness because “[they] know they have what it takes physically to succeed [but the] most successful ones never brag about this … their assuredness is obvious to anyone who watches … they don’t talk about how good they are ... they are afraid it would come back to haunt them.” That last trait really resonates and follows the behaviour I've observed in world class athletes. The section on being your goals expands on the success traits. It’s suggested that in order to be a champion we need to eat, train, recover, behave, and become a champion. By becoming a champion we’re striving to be the best we can. In our diet it's suggested that we: eliminate processed foods, get our energy from whole sources, limit starchy and sugary foods to during and after workouts. Champions know that “success does not imply arrogance”. There's also mention of how "athletes have a fear of truly committing to their goals" and I can certainly relate. In addition to these broader soft ideas there’s a lot of good technical information on training plans, workout phases, breakthrough workouts, recovery, etc… All of which share a lot of commonality with ultra marathon / marathon training plans. I’m always amazed at the time commitment these Ironman level triathlons require - 15 hours weekly to just complete one! Imagine what a runner could do with 15 hrs or running per week. Your mind will try to convince you that you are different from everyone else, that you need less recovery. History has shown that almost everyone is best served by resting. If you're wondering, Friel, and Byrn suggest recovery should take four to six weeks following a full effort race. This is definitely a book worth picking up. As a cubical dwelling software developer (2009) I was spending 8 or more hours at a desk, I was feeling out of shape and generally crumby, but you can read more on why I'm running. I signed up for a half marathon as a dare, trained for a month, and ran the marathon way too fast, but had fun. That brief stint as a runner lasted a month and a half until I signed up for the full marathon the subsequent year (2010). At this point I realized I needed to take things a little more serious. I started doing my research. Learned about fascinating things like: tapers, technical clothing, and nutrition. I followed a basic online marathon training program, ran the marathon, survived and continued to have fun. Read more about my first marathon. In 2010 I was pretty close to a Boston Qualifier and quickly signed up for my next marathon (Vancouver 2011) with the ambitious (secret) goal of breaking three hours. Now I started taking things more seriously... I trained through the winter! 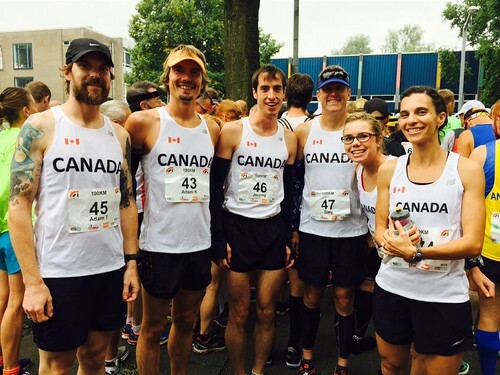 I ran Vancouver, but had a humbling marathon. I made so many mistakes in that race (not enough water, not enough fuel, not enough fitness) and hammered into the wall. Read more in my 2011 marathon results. In 2011 I flitted with a couple other marathons that summer improving my nutrition, but left the three hour goal largely untouched. Finally in 2012 at the Kelowna marathon I broke that three hour barrier and it feels like so much has changed. I've been running with people that are significantly faster and more experienced than myself over the past year (I find it motivating to be the slower guy). I've accepted that running is hard work, there are no shortcuts to improving. If I want to run faster I need to run more and at a relatively easy pace (75% heart rate maxish, not at a harder pace). 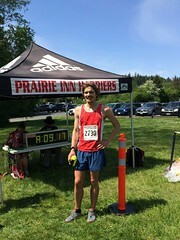 While training for my sub three hour marathon I ran five days a week logging 80km (50mi) per week, whereas my previous marathons training was three days a week with about 60km (37mi) weekly. Recently I've been running my long runs based on heart rate as opposed to pace. I've bought into the theory that by running based on effort I'm compensating for adverse weather and more difficult running routes. Interesting enough I'm running my long runs faster while following effort vs pace. I'm focusing less on complex training programs, although every run has a goal (75% HRM, V02Max, endurance, etc...). I've started running tempo runs in place of intervals (the jury is still out on whether this is a good idea). I also started working exclusively at a stand-up desk (tight hamstrings, running, sitting, weren't jiving with my running). Running has become my lifestyle. Here's my track from Kelowna. Update: In 2013 I ran a new personal best of 2:43 at the Sacramento Marathon.